Eden: a world of perpetual darkness, lit by fluorescent vegetation and headed by geothermal trees. Five hundred humans - the Family - live in an isolated valley. They are all descended from the same couple, Tommy and Angela, astronauts stranded on Eden one hundred and sixty years ago. As a result, genetic deformities and aberrations amongst the Family are commonplace. The Family is held together by the dream that one day Earth will send a rescue ship to pick them up and take them home. For teenage hunter John Redlantern, this dream is a futile delusion. He believes that the Family must branch out to survive, as the valley's food stocks are dwindling. But the only way out of the valley is a dangerous ascent over an unlit, freezing mountain that has killed every person who has tried to climb it. John's determination to escape to a better place splits the Family apart, but how much is John's plan motivated by a desire for humanity to survive on Eden and how much to appease his own ego? 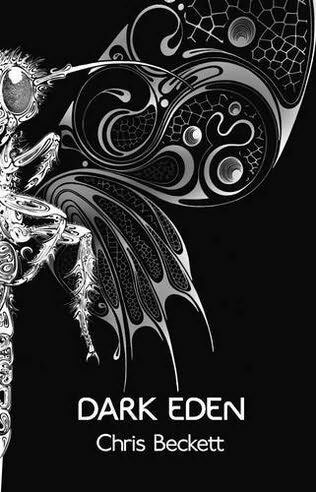 Dark Eden is a dark (thematically and literally) novel that uses an interesting SF concept - a world in perpetual darkness - to explore themes about human society and the impact of ideas, traditions and rituals on a small group of people. Chris Beckett, the author of the excellent Holy Machine, has been noted as an author who fuses SF subject matter and 'literary' ambitions together into something interesting. Whilst hardly new - there's a faint hint of Brian Aldiss or early Ballard to his work - it's something that Beckett does well, creating stories that work from a scientific viewpoint as well as a literary one. Eden itself, with its luminous trees and vividly nocturnal wildlife, is a fine, stirring creation. It's the inverse of the superheated Earth of Aldiss's Hothouse, a world here plunged into utter darkness and, away from the geothermal foliage, total cold. How this is possible is left to the reader's imagination: does the planet orbit a black hole or a brown dwarf? Does it orbit a normal star and is merely tidally locked? If the planet is indeed freezing cold, how does the atmosphere not simply melt away? Various solutions to such questions present themselves but are ultimately left ambiguous. The Family survive by clinging to one central belief - that a rescue ship will come from Earth to find them - and their entire existence revolves around it. They refuse to travel far from their ancestors' landing site, even though local food sources have been almost exhausted. They constantly tell stories about their ancestors and the founding of their society. But they are trapped into a mode of existence so all-consuming it is taken for granted. When John Redlantern is able to step back and point out the flaws in their blinkered worldview, it creates strife and discord. A serpent enters this Eden, but this time we are on the serpent's side, as the Family remaining where they will ultimately destroy them. At the same time, John is motivated not just by a desire to save his people, but also to prove himself better than them, a visionary leader. Beckett's structure - he uses a rotating first-person POV, swapping characters every chapter - allows us to see events from John's perspective and also from that of both his friends and enemies, allowing a tremendous depth of character to be achieved (both of John and several other key characters). John's character is built up, deconstructed and reassessed with tremendous skill. Beckett is keen to avoid passing judgement: some of John's actions are admirable, others are loathsome, and the reader is invited to decide which is which. At the same time the story moves forward, it also moves back. The story of how Tommy and Angela ended up on Eden is revealed in layers, as more and more stories and legends from the distant past of Eden are revealed, and the story that the people of Eden know may not be the whole truth. It's also a story that doesn't have an ending, as the fate of the three astronauts who left Eden in search of help is not known (in the novel's only possible misstep, Beckett eschews the ambiguity of the rest of the book to give as a fairly straightforward answer in the book's climax). The Family want to stay in their valley so the rescuers can find them, and the end of the story can be known, whilst John and his followers want to abandon such beliefs and strike out in search of their own destiny. Conflict follows and both sides' arguments have their merits. Dark Eden (*****) is a superb novel about ideas, the struggle to survive and the dangers of blind faith. Beckett says little that is new, but makes his points with subtlety and intelligence, all against a well-realised, vividly-described backdrop. The novel is out now in the UK and is available on Kindle in the United States. This premise sounds awesome, want to read this. Agreed, insofar as I'm in a position to agree. I'm only 100 pages into Dark Eden, but it's been incredible so far - leaps and bounds better than The Holy Machine, which was very fine in its own right - and a five-star review from you makes me an optimistic Scotsman. Ta, Adam. Unfortunately it is not available on Kindle in the US currently. Not sure why. What's up with HALF-LIFE 3?